NO PURCHASE NECESSARY. A PURCHASE WILL NOT INCREASE YOUR CHANCES OF WINNING. GIVEAWAY BEGINS AT 9:00 AM (ET) ON OCTOBER 31, 2013 AND ENDS AT 11:59 PM (ET) ON NOVEMBER 24, 2013. 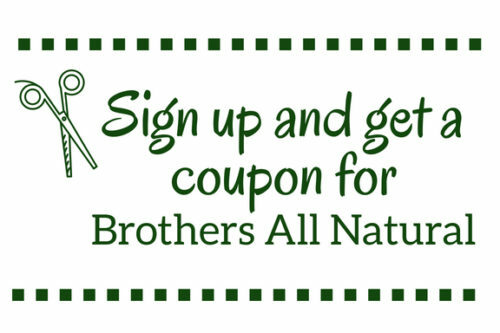 HOW TO ENTER: Enter to win on the Brothers-All-Natural Facebook page at https://www.facebook.com/Brothers.All.Natural. The giveaway details and link for entry is also available at http://blog.brothersallnatural.com/ChristmasStory30-giveaway. NOTE: No mechanically reproduced form entries or postcard entries will be accepted. Sponsor(s) are not responsible for technical, hardware or software malfunctions, telephone failures of any kind, lost or unavailable network connections, or failed, incorrect, inaccurate, incomplete, garbled or delayed electronic communications whether caused by the sender or by any of the equipment or programming associated with or utilized in this giveaway. Further, Sponsor(s) are not responsible for electronic communications which are undeliverable as a result of any form of active or passive filtering of any kind, or insufficient space in entrant’s e-mail account to receive e-mail messages. PRIZE(S) AND ODDS: Twenty Five (25) Prizes: Twenty Five winners will be selected to receive a Blu-ray™ Combo Pack of A Christmas Story motion picture and a 24-pack variety of Brothers-All-Natural Fruit Crisps. The odds of winning are determined by the number of eligible entries received. All prize(s) will be awarded (assuming sufficient number of eligible entries). Limit one prize per family or household. NOTE: Warner Bros. Entertainment Inc. is sponsoring the giveaway for the Blu-ray Combo Pack only; there is no affiliation of Warner Bros. Entertainment Inc. to the giveaway of the Brothers-All-Natural Fruit Crisps. Brothers-All-Natural, division of Brothers International Food Corporation, is the sponsor for the 25 boxes of Brothers-All-Natural Fruit Crisps, 24-Pack Variety. ELIGIBILITY: This giveaway is open to individual legal residents of the United States that are 18 years of age or older as of the beginning of the giveaway, except for employees and their immediate families (spouse, parents, siblings, and children) and members of the same household of the Sponsor(s), Brothers International Food Corporation, and all of their respective subsidiaries, affiliates, directors, officers, owners, advertising and promotion agencies, and agents. SELECTION OF WINNER(S): Winner(s) will be determined from among all eligible entries received by a random drawing to be conducted Once on November 25, 2013, by a representative of Brothers International Food Corporation, whose decisions are final on all matters relating to this giveaway. Winner(s) will be notified by email and/or phone. The prize(s) are non-transferable and cannot be substituted. VERIFICATION OF WINNER(S) AND DELIVERY OF PRIZE(S): Winner(s) may be required to sign an Affidavit of Eligibility and Liability Release and, where permitted, Publicity Release. Prize(s) may be awarded to alternate winner(s) selected randomly from other eligible entries if: Affidavit/Release is not returned within ten (10) days after mailing to winner(s); winner(s) fail to meet the eligibility requirements set forth in Section 3; the prize notification email(s) or prize(s) are returned as undeliverable; two attempts to contact winner(s) by phone are unsuccessful; or winner(s) decline the prize(s). GENERAL: This giveaway is void where prohibited or restricted by law and is subject to all applicable federal, state and local laws and regulations. Any and all legal actions or claims arising in connection with this giveaway must be brought in a court of competent jurisdiction within the United States of America. Taxes and fees, if any, are the sole responsibility of winner(s). By participating in this giveaway, each entrant accepts the conditions stated in these Official Rules, agrees to be bound by the decisions of the judges, and warrants that he or she is eligible to participate in the giveaway. Sponsor(s) reserve the right, in their sole discretion, to disqualify any entrant from this giveaway or any other promotion conducted now or in the future by Sponsor(s), Brothers International Food Corporation, and all of their respective subsidiaries, affiliates, directors, officers, owners, advertising and promotion agencies, and agents if his or her fraud or misconduct affects the integrity of the giveaway. Winner(s) agree to hold harmless and indemnify Sponsor(s), Brothers International Food Corporation, and all of their respective subsidiaries, affiliates, directors, officers, owners, advertising and promotion agencies, and agents from any and all liability, loss or damages or causes of action arising from or in connection with entrant’s participation in or winner(s)’ receipt or use of the prize(s) awarded in the giveaway. Winner(s) agree to the use of their name, likeness, biographical data, and/or voice in any and all advertising, promotions, and other publicity conducted by Sponsor(s), Brothers International Food Corporation, and all of their respective subsidiaries, affiliates, directors, officers, owners, advertising and promotion agencies, and agents in any medium without additional authorization, compensation or remuneration to the extent permitted by law. Sponsor(s) are responsible only for delivery of prize(s), not for use, utility, quality or otherwise. WINNER(S) LIST: To obtain the list of winner(s), send a self-addressed, stamped envelope to: “Brothers-All-Natural Christmas Story Giveaway”, PO Box 60679, Rochester, NY 14606. Requests must be received by December 9, 2013. Winner(s) list will be sent after selection of winner(s). SPONSOR(S): Warner Bros. Entertainment is the sponsor for the 25 Blu-ray™ Combo Packs of A Christmas Story motion picture giveaway; and Brothers-All-Natural, division of Brothers International Food Corporation, PO Box 60679, Rochester, NY 14606, is the sponsor for the 25 boxes of Brothers-All-Natural Fruit Crisps, 24-Pack Variety.